No longer will potential buyers have to view the Chevy Volt at auto shows and indoor Ride & Drives. Consumers wanting to test drive a Chevrolet Volt, the electric car with extended-range capability, will be able to test drive in the streets. According to media.gm.com news release, Chevrolet dealerships in the initial launch markets of California, Connecticut, Maryland, Michigan, New Jersey, New York, Texas, Virginia and Washington, D.C. will be receiving dedicated Volt demonstration vehicles for customer test drives over the next few weeks. “We know the best way to experience the Volt is to get behind the wheel and drive it. Now dealers will have the ability to allow consumers to form their own opinions of the Volt through test drives and demonstrations,” said Cristi Landy, Chevrolet marketing director. According to GM research, 85 percent of consumers searching for information about the Volt on Chevrolet.com also looked at other Chevrolet vehicles. “We are seeing that the Volt is increasing traffic onto our dealer showroom floors and is exposing consumers to Chevys line of ‘gas-friendly’ vehicles, including the Cruze Malibu and Equinox,” Landy said. In the first quarter of 2011, approximately 550 demonstration Volts will be delivered to Chevy dealers. By the end of the year, more than 2,500 U.S. dealers will receive a dedicated Volt for consumer demonstrations and test drives. The demonstration Volts are the latest step Chevy has taken to match customer interest. 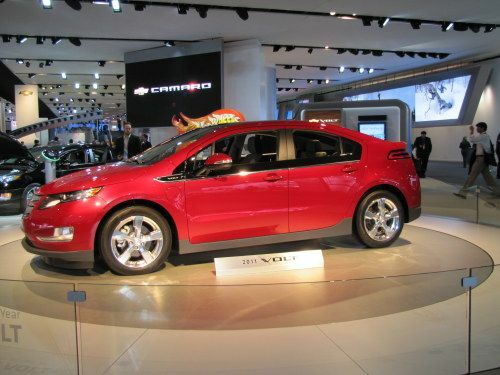 Chevy expects to deliver Volts in all 50 states by the end of 2011. According to the official description, the Volt is an electric vehicle that offers a total driving range of up to 379 miles, based on EPA estimates. For the first 35 miles, the Volt can drive gas- and tailpipe-emissions-free using a full charge of electricity stored in its 16-kWh lithium-ion battery. When the Volt’s battery runs low, a gas-powered engine/generator seamlessly operates to extend the driving range another 344 miles on a full tank.